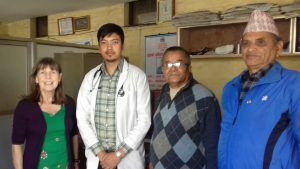 Gorkha Municipal Hospital is a small hospital with limited resources serving Gorkha District and serving a very rural and disparate population in the mid hills of Nepal. Many patients will suffer long journeys to get to the hospital but alternative hospitals are 4-5 hours away in Kathmandu or Pokhera or small private hospitals which are not an option for most rural people. Funds to the Government hospital are limited and Doctors can be transient as many prefer the larger hospitals with better facilities. As well as all this, the main building at the hospital remains damaged from the earthquakes which caused devastation in the region in April 2015. At that time GDS were asked to supply wheelchairs and we were happy to supply funds for 3 wheelchairs at that time. In early 2017, GDS were approached to help by providing funds for equipment. Following a visit to Gorkha by Co-Chair/Secretary Linda Blunt. When she met with the Doctors, a priority list (with 92 items!) was compiled, and at the top of the priority list were Oxygen concentrators. April 9th Dr Santosh wrote:- As we all know that oxygen supply is one of the basic thing that a hospital need for service delivery. Our hospital don’t have its own oxygen supply plant. We are totally dependent upon the oxygen delivery into the cylinders from Bharatpur, Chitwan. We have 8 big cylinders and few small cylinders. And as per the flow of patients, these cylinders get emptied very soon and need to be replaced. But our main problem is we don’t have any stock cylinders and the transporters carry these cylinders only when all of them are emptied. So for that transaction period there’s been scarcity of oxygen in our hospital. Many times we need to refer the patient just because we don’t have oxygen. And the road condition of Narayanghat – Muglin is so unpredictable that we aren’t getting the supplies on time. Overall it seems costly oxygen supply. This looked like something we could clearly help with and were happy to receive a full application through our Gorkha committee, for the items Dr Tiwari, Dr Duwal deemed as most important. Is the Hospital able to meet running costs of equipment – disposable tubes, face masks etc? Can the Hospital maintain machines and undertake repairs? Maximum use of equipment is ensured and they will not end up broken/unused in a cupboard! Dr Tiwari provided the reassuring reply: – We will definitely use these equipments and we are aware of the importance of proper handling and regular maintenance of these equipments. We are desparately in need of these so there is no cupboard in the whole Hospital to keep the equipments unsused! Thank you again for the support for poor people of Gorkha. Doctors with GDHEDS committee and volunteer Richard handing over the equipment. GDS then agreed for the money to be released for the purchase of the equipment. 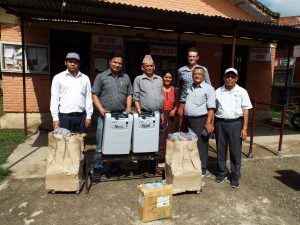 In May we were thrilled to see that as our volunteer Richard van Este arrived in Gorkha, the equipment was ready for delivery into the hospital as can be seen with committee members and Doctors with Richard. Naomi Cairns who was a former volunteer, is now Medical Student and GDS Trustee, visited Gorkha in September. Naomi had undertaken a Triathlon in London in June which raised a total of £564 with the funds being used towards the donated equipment. 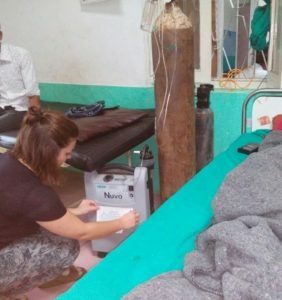 Naomi was therefore thrilled to be able to see the oxygen concentrator and the other equipment purchased through the UK fundraising, now in use by patients at the hospital and making a difference to people’s lives when most needed in the hospital and very clearly saving lives. Each oxygen concentrator cost £850. The machine takes oxygen from the air, compresses it and makes it available to the patient resulting in a constant supply of oxygen to the patient. There is no cost of buying in oxygen cylinders, no risk of delivery not arriving or the tank running out when a patient most needs it. Its win all round. The Doctors are of course so grateful for the immense help this provides for patient care. We will now work with the Doctors to see how we might best help in the future.